Goodnight Server Room is a lighthearted exploration of how computers work and the words we use to talk about them. Originally released as a children’s board book, the game takes a story about the adventures of data and puts you in charge. 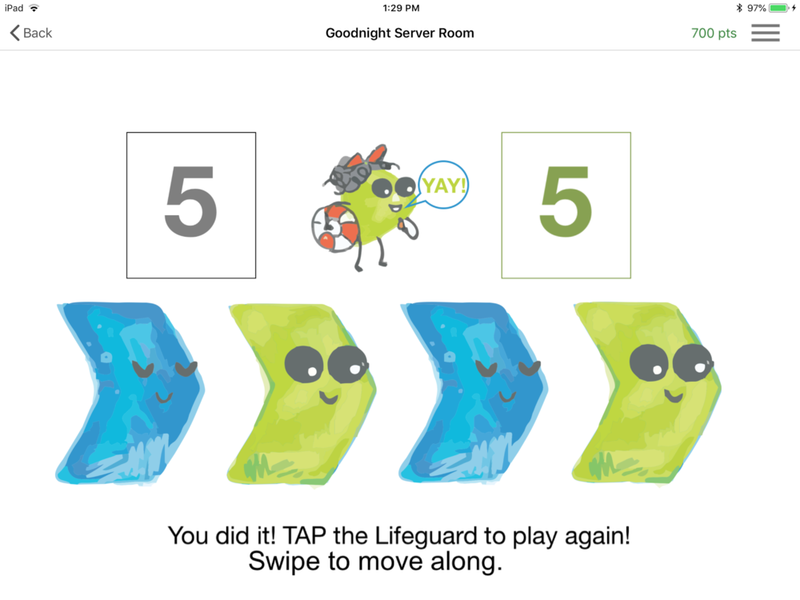 The Goodnight Server Room Game is fun for kids from ages one to one hundred. There are lessons for the second graders, nuggets for the adults, and goofy characters for the toddlers. The game has no ads and no hyperlinks. Goodnight Server Room brings computer science and information technology to life. Bits and bytes leap off the page, engaging you with foundational concepts of computing. Learn how to write numbers in binary, find bugs, and get started with formal logic. Read the story aloud to your kids, or let them explore on their own. Goodnight Server Room introduces the terminology and concepts of information technology in a fun and approachable style. And bugs. Don’t forget to find all the bugs! Download it for free from the App Store. You can also play free online at gsrgame.smithdtyler.com. You can order the book on Amazon, or Etsy, or find it in stores like The Red Balloon in Saint Paul, and the Minnesota Center for Book Arts in Minneapolis. For a full list of brick and mortar stores, check here. T.D. Smith is a writer, software engineer, and heavy metal enthusiast who would like you to know that engineering and art have more in common than you might think. Realizing there weren't any children's books that described what he did all day, he wrote Goodnight Server Room to introduce his two (soon to be three) little boys to software engineering. Goodnight Server Room was made possible by some amazing KickStarter backers! The artwork for Goodnight Server Room is by Minnesota artist Emily Krueger. Andamio Games is a Minnesota ed-tech startup best known for the collaborative neuroscience education game iNeuron. Andamio has developed a platform called FORGE, app building software for non-programmers who need to build their own apps quickly. FORGE was used to create this game. Q. Are there any ads in the game? A. No! The game has no ads, links, pop-ups, or noises. Q. What was the most fun part of building the game? A. (T.D.) My favorite moment was the first time I saw the little packets proudly shouting the names of binary operators. A. (Andamio) Tyler came to us with everything: incredible art, beautiful layouts, and several ideas for game play. So we got to spend more time playing around with “stealth” learning games - figuring out fun and intuitive ways to teach binary without the reader knowing they’re being taught at all. Q. What was the hardest part of building the game? A. (T.D.) It took a few iterations for us to figure out how to present binary arithmetic to a second grade level audience. We wanted to have a minimal requirement for reading, so we had to visually illustrate the goals and teach the user what to expect. A. (Andamio) Creating interactions that worked for both toddlers and their parents. Two different audiences who interact with devices in completely different ways. How can we design something that “works” for both? Q. How long did it take to build the game? A. (T.D.) I just had to provide a presentation with the artwork and game ideas. Andamio generated the game with FORGE. We tested an initial version on the game with a class of second graders at Meadowbrook Elementary. They gave helpful feedback that we worked into the final version. Coordination with Andamio was easy because we could just email PowerPoint files back and forth. A. (Andamio) The first iteration took about 8 hours - this got us quickly to a prototype, so we could start iterating on the game play. It’s hard to know if a game will work until you put it in the hands of your intended audience. Probably another few days, all told, iterating and improving. Q. What are your goals for the game? A. (T.D.) Most of the game is designed to help kids from first to fourth grade learn about introductory computer concepts. However, the programming part of the game is designed specifically for my two year old. You’ll see why when you try it. A. (Andamio) Goodnight Server Room really demonstrates the power of FORGE, our app development platform. I’m neither a computer programmer nor an instructional designer, but I was pressed into service because our key people were swamped with other projects. And even with some rookie mistakes we were working with an iOS prototype in about a day. A. (T.D.) I’m working on a longer story in the same vein as Goodnight Server Room. My kids are getting older, so this next book is aimed at the three to five age range (it is about one thousand words). A. (Andamio) We’re talking to some other children’s book authors, and several businesses interested in making their new employee on-boarding and training more interactive and engaging. Our goal is to make FORGE a turnkey, web-based service, so we’re talking to as many people as we can to make sure our vision matches with the problems they’re trying to solve.